The College will present a concert that combines percussion and piano, in a program called Hands and Hammers at 7:30 p.m. Tuesday, Feb. 5, in the Mitchell Auditorium. Join Dr. Jeremy Craycraft, percussionist and music department chair, and pianist and assistant professor of music Dr. Nicholas Susi for a performance dedicated to the compositions of German composer and percussionist Alexej Gerassimez and Greek composer and guitarist Giannis Papakrasas. Gerassimez's compositions are known for his exploration of rhythmic and acoustic possibilities and the creation of individual sounds. Papakrasas' work is characterized by atonality within a strict rhythmical, melodic and harmonic nature. 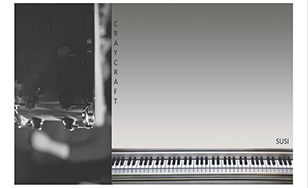 In addition, Craycraft will perform marimba pieces by Hungarian composer Csaba Zoltan Marjan, and Susi will perform piano pieces by Beethoven/Liszt and American composer John Corigliano. Tickets cost $10 and can be purchased through the Spotlight Box Office. Contact the Box Office at 218-723-7000 or spotlight.css.edu.